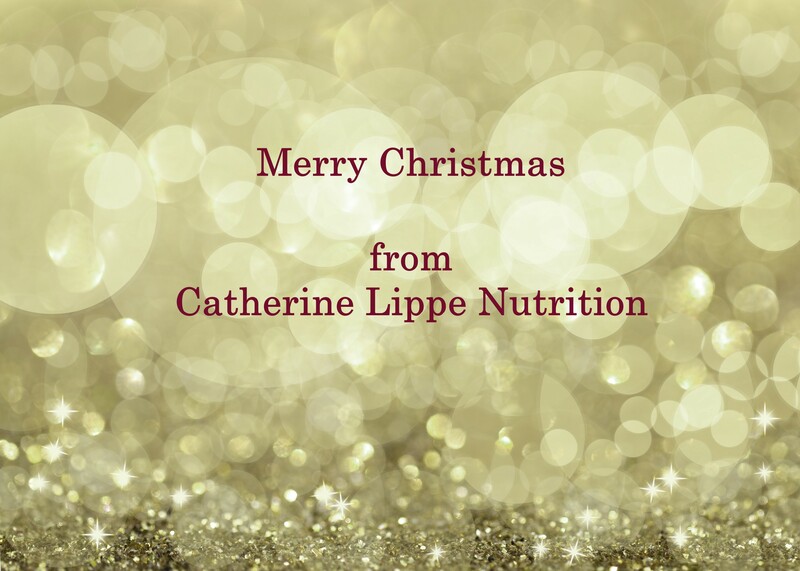 Have yourself a Merry Healthy Christmas! My Christmas wouldn’t be the same without mulled wine, mince pies and chocolates hanging from the tree but I don’t want it to only be about those things. For my kids, especially, I will always strive to make this time of year a happy and memorable one. A trip to the grotto, advent calendars, carols around the tree and Christmas parties galore, sure, but it troubles me when every one of these festivities results oodles of sweets and chocolates. I’m not saying never give the sugary foods but why do we do it so much more at times of celebrations? Doesn’t associating celebrations with sugar make the sweet foods more exciting and more desirable? Doesn’t it instil the idea that celebrations are a time to put our usual eating habits aside and fill up on whatever takes your fancy? Neither of these approaches are helpful if we want to encourage healthy and positive relationships with food. Celebrations can be a time to get creative with all types of food not a time to push aside healthy eating habits in favour of buckets of chocolates. 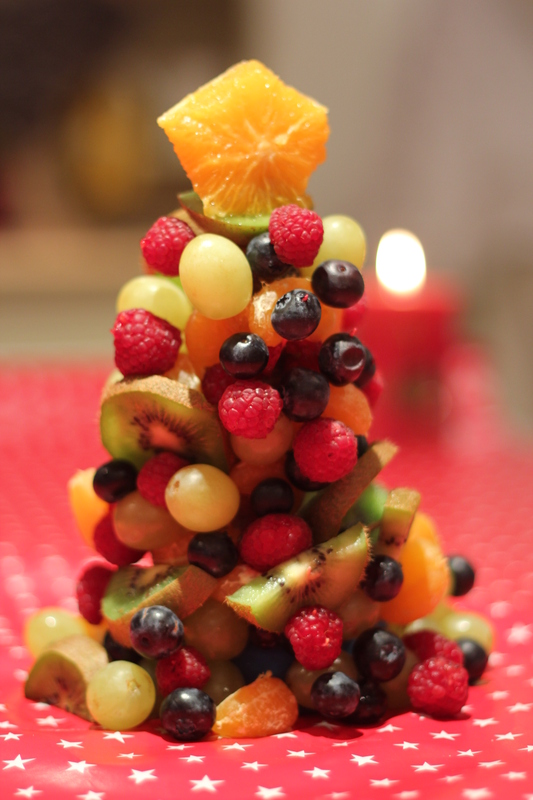 If you have the patience of St. Nicholas this fruit tree makes a great centre piece for your festive spread! It's perfect for nibbling on and a great incentive to get kids eating their fruit and veg as well as chocolates this Christmas. A fun one to try out and if you're more artistic (as well as patient) than me it'll probably be an absolute winner. 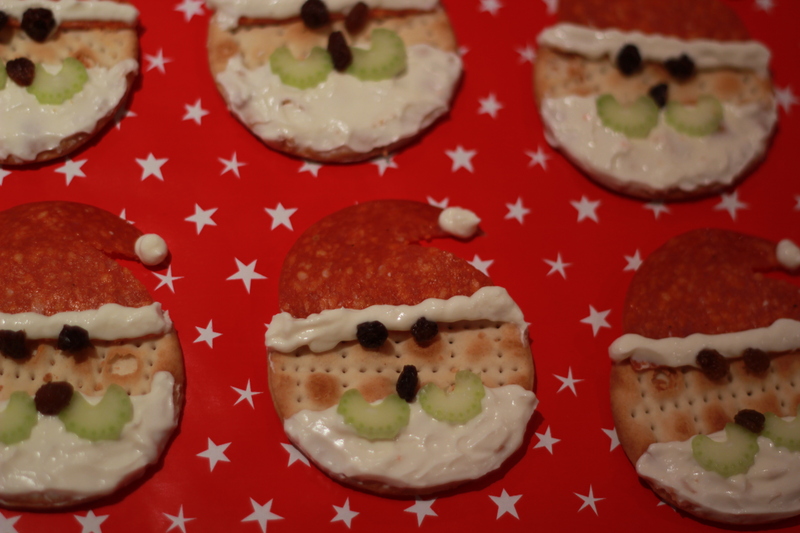 These appetising Santas are made using a round cracker, salami slice shaped into a Santa hat, cream cheese piping for the beard and hat trim, celery slices for a moustache and currants for the eyes and nose. Top tip – mixed the cream cheese with a little natural yoghurt first to make it easier to work with and put a dot of the mixture on the back of the salami slice to help it stick to the cracker. 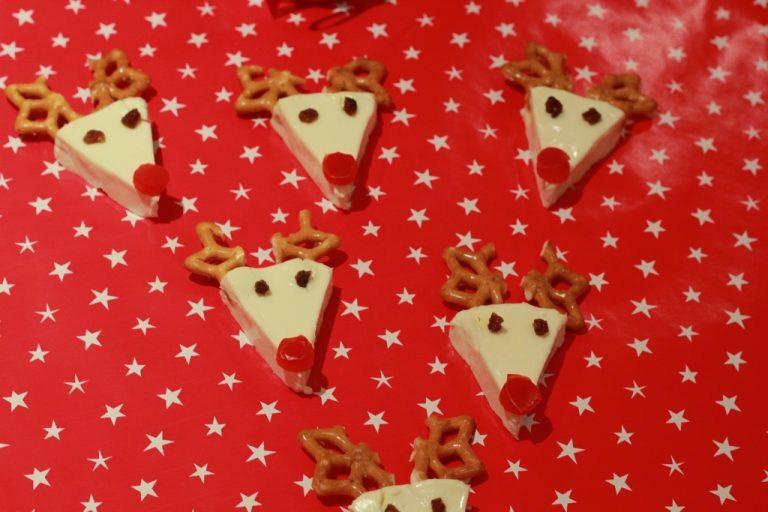 Soft cheese triangles with pretzel antlers, currant eyes and red pepper for the all-important red nose. These tasty snacks are almost too cute to eat and super easy to make too. 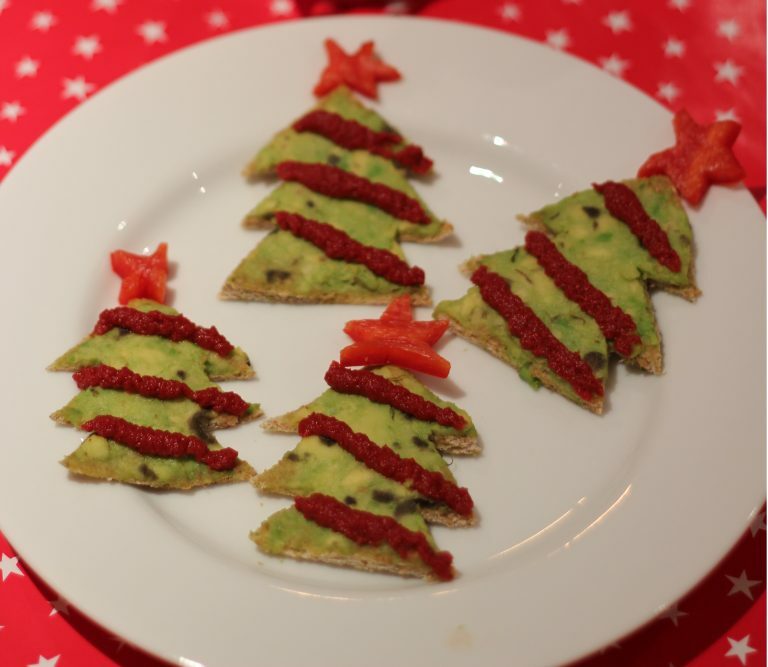 Spread a whole pitta bread with mashed avocado or guacamole then using a pastry cutter or sharp knife cut into a Christmas tree shape. It’s beast to spread on the avocado first as you will get a cleaner finish to the shape of the tree. We used red peppers for the star on top of the tree but you could use whatever fruit or vegetable works best for you. Then complete the decoration by using a tube of tomato puree pipe on some tinsel. Who doesn’t love a mince pie at Christmas? 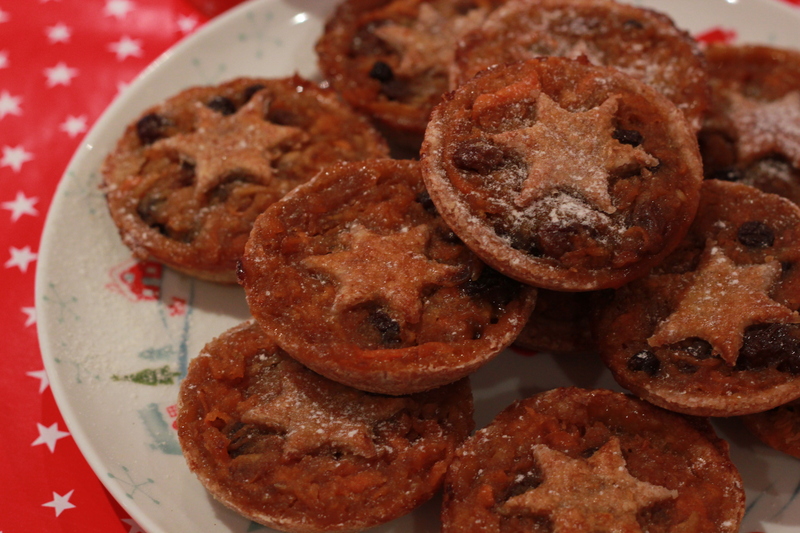 I've adapted this mince pie recipe to boost the fibre and vitamin and mineral content. Rub the butter into the flour until it resembles fine breadcrumbs or mix in a food processor. Avoid handling the pastry too much as it can make the pastry become tough. Wrap the pastry in cling film and leave to rest in the fridge for at least 30 minutes. Finely grate the carrots and apples, you can leave the skins on, and add to the mincemeat – mix well. Once rested roll out the pastry and cut out 24 round bases for each pie plus 24 small stars for the top. Spoon a heaped teaspoon of the mincemeat mixture into each pie and top with the stars. Glaze each star with a beaten egg and bake in the oven for 20 minutes or until the pastry has browned and the filing is bubbling and caramelised. The pies can be kept in an airtight container for 4-5 days or frozen for up to 1 month. And remember that as well as all the yummy foods, festive games, songs, dressing up and decorations are just as fun to get the kids involved in.